With a legal career spanning more than six decades, the late Morris D. Rosen left an indelible mark on his native Charleston and, by extension, the entire state of South Carolina. As corporation counsel of the City of Charleston (1959-1975), Morris Rosen, ’47, was instrumental in helping dismantle segregation and will forever be remembered for playing a pivotal role in the peaceful integration of Charleston’s municipal golf course. He was in charge of the lawsuits and arrests following demonstrations in the 1960s and became lifelong friends with Judge Matthew J. Perry Jr., who at the time represented civil rights workers. Guiding Charleston through this tumultuous time was just one of the ways Rosen sought to make his beloved city more prosperous. He was also influential in helping the city expand its century-old boundaries, restructuring Charleston City Council and establishing the Charleston County Aviation Authority. 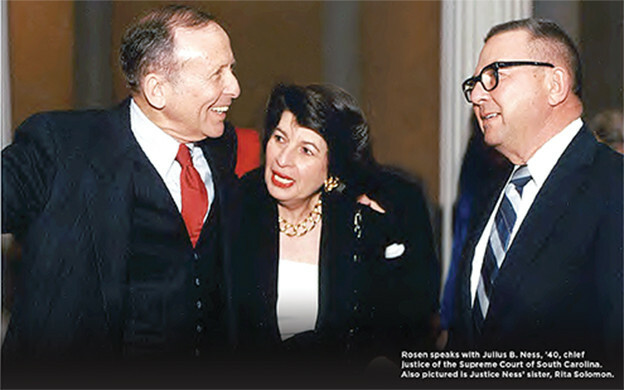 Rosen’s reputation quickly grew beyond the Lowcountry, and he was widely recognized as a leader in the S.C. legal community. But above all his accomplishments, perhaps his biggest impact was made during the countless lunches in which he mentored many of Charleston’s up-and-coming attorneys. Rosen, who passed away in 2012, will continue shaping the lives of future lawyers through the Morris D. Rosen Endowed Scholarship, which was established in September 2014 by his two sons, Richard and Robert. The scholarship will provide essential funds, making it possible for University of South Carolina law students to realize their dreams of becoming lawyers. Morris Rosen was the first in his family to graduate from college, and after serving in World War II, he moved to Columbia to attend the School of Law, graduating in 1947. Richard Rosen says his grandparents had a very limited budget but were as supportive of his father as they could be. And while Morris Rosen’s successful career made it easier for Richard, ’75, and Robert, ’73, to afford law school, they knew they wanted to help other deserving students who — like their father — had limited financial means to attend USC Law. The Morris D. Rosen Endowed Scholarship was one of seven scholarships created in the 2013-14 fiscal year. Scholarships help the School of Law attract high caliber students with exemplary academic records and proven leadership qualities, while keeping tuition affordable for those in need. More importantly, they provide future law students the opportunity to join the profession and make a difference in South Carolina and beyond. To learn more about creating an endowed scholarship to help a worthy student achieve his or her goal of a legal career, contact Michelle Hardy, senior director of development and alumni relations, at (803) 777-3407 or hardymt@law.sc.edu.